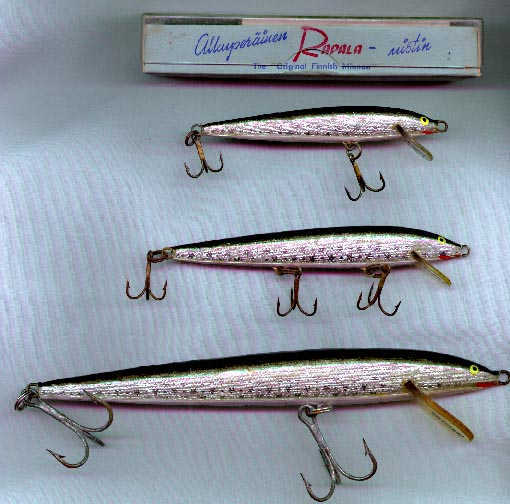 On this page I hope to describe some of the Rapala lure's I have in my collection. Not all are antiques. I have a few that I will explain more in that section on this page. I hope you enjoy. I hope to have some images (scans) of some of them soon. I also will update this page as I collect more lure's. This newest addition is a collection of 3 lure's. A #9, #18 and a #11 in the box. All of them are Hopea Silver. Plus they all have in black print "Original Rapala" on the lip and "Finland on the belly. The Box for the #11 has the insert and the Rapala "fish" logo on one end plate. This is a great set of lure's. All in great shape. 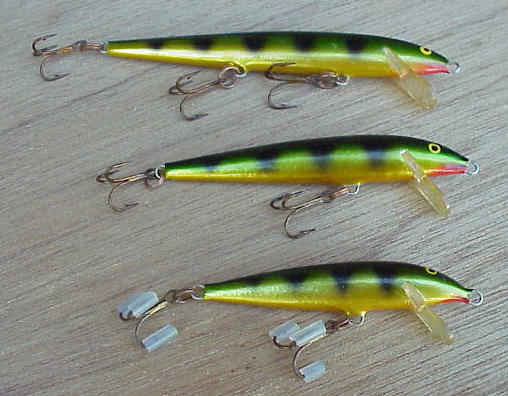 I have been able to get another one of these interesting Rapala crankbaits. This one is the the smaller size of this lure style. This is the 1st lure of this style I was able t get. I knew nothing of this lure. I was finally able to get some info out of a 1976 Normark-Rapala catalog, that I was also able to add to my collection. A ? 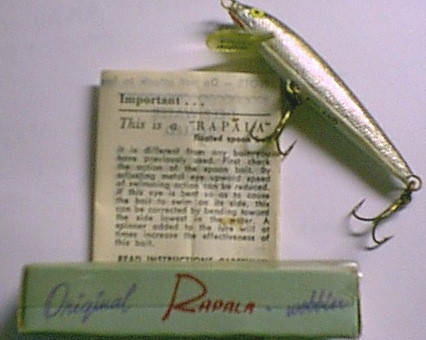 Original Rapala.View here. My newest addition. This Rapala is gold in color and has red print on the bottom. This lure is marked in black print 'Original Rapala' on the lip and 'Finland' on the belly. A 9s Hopea Silver original wobbler in the box. This lure is marked with black print 'Original Rapala' on the lip and 'Finland' on the belly. A 11s Hopea Silver Original wobbler. This lure is marked 'Original Rapala' on the lip and 'Finland' on the belly in black print. This lure is marked in black print 'Finland' on the belly. 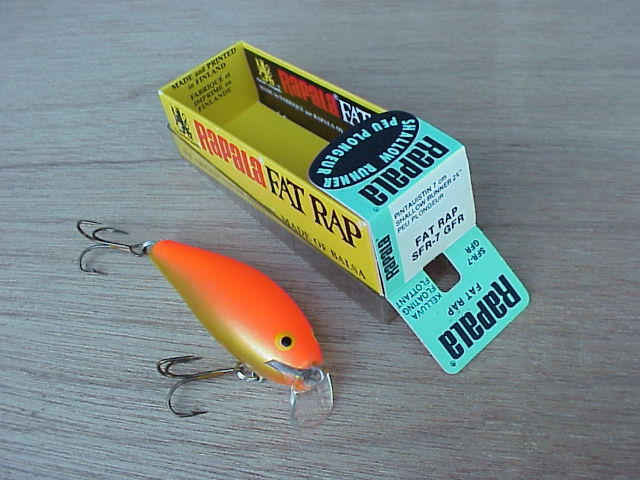 The lip is marked 'Rapala Original' in clear writing. This lure is marked in black print, 'original rapala' on the lip and 'Finland' on the belly. This perch pattern lure is different in that it has a lite gold tone on the belly. This rapala too has the gold tone belly perch pattern. Like the other 2 above this is also in the gold tone perch pattern. A pic of the 3 Perch Floaters.View here. A Special thanks to all those that allowed me permission to use the scans of the lures. This is a small group of lures that I have gotten by being a member of the Rapala Club. A Husky Jerk, HJ-12 View here. A Shad Rap, CDSR-7 RO View here. A husky Jerk, HJ-6 CGH View here. 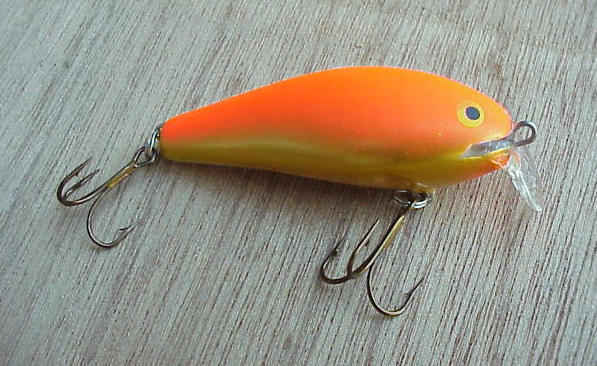 This lure is in a 'pearl/orange bar head' pattern. A F13 Floating Minnow, Perch pattern.View here. 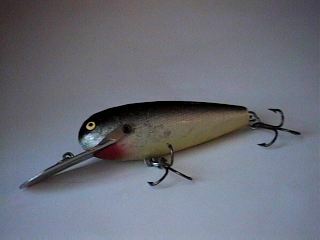 This lure went on the shelf after the 1997 fishing season. During that season. I was able to C/R over a 100 bass on this lure. This lure is scared and scraped but Oh what a lure it was. 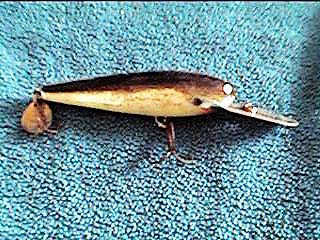 A F11 Floating Minnow, Perch pattern. Brand new and more than likely, my most expensive Rapala. This lure is missing 1 barb from the back treble hook. Thanks to the good Dr. for removing it from my finger. Rapala Minnow Spoon. View here. A RMS-07 spoon in a special edition Hot Claw color pattern. This scan turned out great. The colors just jump right out at ya. Brand new, Mint in the box. I bought 2 complete sets. What a great looking lure. Rapala's first All topwater bait. 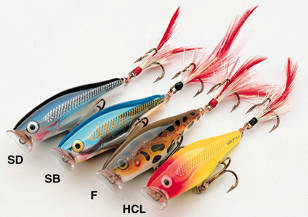 The color patterns are HCL-Hot Clown,SD-Shad,F-Frog,SB-Silver Blue. Well, that's it for this page. I'll be updating these pages as I come across "new" items to add to my collection. I hope you were able to gain a little more knowledge about Rapala Lures. Updates about this project can be found on the next page.